We recently wrote about Glasgow’s controversial and expensive road expansion—an elevated six-lane highway to complete Glasgow’s ring of motorways that will cost more than $200 million per mile. But despite the hefty price tag, the road is only the second most expensive project in the United Kingdom. This month the U.K. will witness a 1.2-mile tunnel project, the A3, in Surrey, a county in southeast England. The estimated cost of the project: $402 million per mile. Once completed, the expensive yet short tunnel road will become the longest of its kind in the U.K. Although most people reading the prices of these projects may still be in sticker shock, Geoff French, the vice president of the Institution of Civil Engineers, does not find it surprising at all. “There’s a huge cost penalty when you put a road up in the sky or down in the ground,” he says. According to Transport Scotland, the cost for a new three-lane highway on average is $47 million per mile. Based on these calculations, the 1.2-mile tunnel in Surrey will be 10 times the average cost of a new highway. Part of the reason for the high cost, at least in the case of Glasgow’s M74 extension, is that the construction project requires the compulsory purchasing of property. With the addition of the cost of planning consultation and public inquiries, the cost goes up—and that’s for an elevated road. “An underground road costs even more—roughly twice that of an elevated one,” BBC reports. The higher cost makes sense. In addition to difficulties of actual construction, underground projects must deal with geology. The presence of rock, for example, is recorded as an ideal opportunity for underground space development, according to Australasian Tunnelling Society. Digging through soil is even better. However, running into granite during the construction process can become time-consuming and more expensive because it’s more difficult to blast and dig through. Besides geological obstructions, a tunnel construction project must consider the excavated soil and rock: what to do with it, where to get rid of it and how to take it there. Another factor to consider is support for the dug up tunnel. The machine responsible for digging the tunnel is considerably smaller than the tunnel itself. Once the machine goes deeper in the path, the dug up tunnel must be supported with precast circular segments, to avoid the collapse of the earth. All of these details considerably add to the price of a tunnel project. “But sometimes there is no alternative to going underground,” reports the BBC. 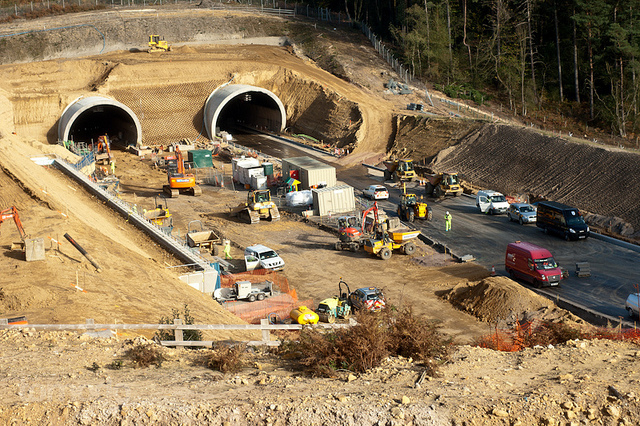 “[The A3 tunnel] allows the road to expand to four lanes by digging up to 195ft (60m) under Hindhead Commons.” And according to Rob Fairbanks, director of the Area of Outstanding Natural Beauty, “Building a dual carriageway on the surface would have caused great damage,” perhaps because the surface has significant landscape value. 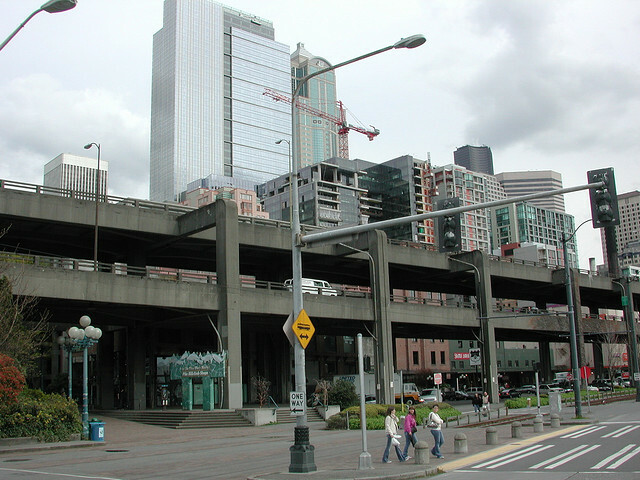 Demolition work on Seattle's Alaskan Way Viaduct started in February 2011, relieving the city from maintenance costs. Photo by Cliff. Money is a big motivator for such a decision and it is by no means a localized issue. Seattle’s Alaskan Way Viaduct, with the wear-and-tear of the years and the damage of a 2001 earthquake, was demolished in February 2011, making way for an underground tunnel in the region. But money is not the only motivator. Portland’s four-lane freeway, Harbor Drive, was shut down in the ’70s in a beautification effort of the west bank of the Wilamette River. The space is now occupied by a greenway and the current success of Portland’s downtown is credited mostly to the demolition of Harbor Drive. San Francisco went through a similar transformation with its Embarcadero Freeway. Although the freeway’s actual demolition didn’t come to fruition until damage from a 1989 earthquake, the road was believed to be “the city’s worst planning mistake” and “denounced as an eyesore” that blocked the waterfront early in its lifetime, according to a New York Times article from 1990. Today, a handful of U.S. cities are joining the movement. New Haven, for example, has been debating whether to convert a one-mile expressway corridor into a network of city streets. The Board of Alderman decided in December 2010 that it would accept a federal grant and pursue the demolition. But perhaps the trend hasn’t gone national quite yet. Similar to Glasgow’s M74 or Surrey A3, Boston completed a $20-billion, 3.35-mile tunnel project that re-routes the city’s main highway. In early June, we reported on a new study by Smart Growth America that said, between 2004 and 2008, states spent $37.9 billion annually on repair and expansion projects for their roads and highways. By the same token, “Anyone who follows infrastructure maintenance can tell you that this country has not been doing it’s job when it comes to maintaining roads,” as blogger James Sinclair wrote for Stop and Move, saying we face a potential future of “crumbling” highways and “structurally unsound” overpasses. It looks like we have a long way to go. Outside of the U.S., cities have gained international recognition for tearing down unnecessary concrete. One recent high-profile example is Seoul, where city planners helped to restore the Cheonggyecheon river by removing three miles of elevated highway, which help cut air pollution and reduce air temperatures. According to Patrick Condon, Vancouver owes its livability to its lack of freeways. Photo by Evan Leeson. 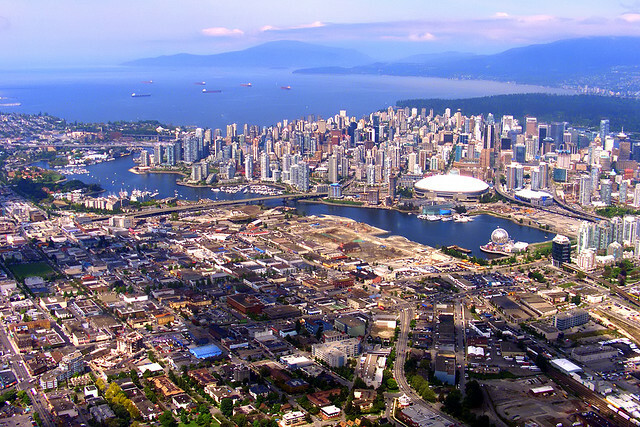 Instead of building freeways, Vancouver’s local councils gathered to draft a long-term plan for the city’s growth. “Central to the plan was investment in public transport, cycling and pedestrian measures—not freeways,” explains the Age. “The theory was that congestion, and the desire to avoid it, would drive commuters to alternatives: moving closer to their work and using the trains and bus system.” No freeways, no way to run off to the suburbs.